Regardless of water levels, the whitewater rapids in Cataract Canyon are very fun and challenging. In higher flows of spring runoff, the waves become monstrously large. During this time of year, Western River uses J-Rig rafts that were built for, and match the size of the larger waves. Once the slopes of Wyoming and Colorado have released the bulk of their winter snow, Western sizes down to Oar-rigs and Paddle Rafts to match the ride to the waves. This switch of rafts generally occurs in late June or early July and continues through the summer season. 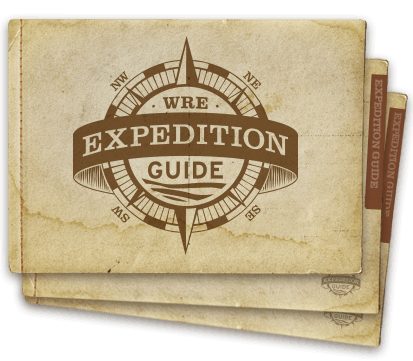 Western River Expeditions created the "J-Rig" specifically for the big water of the Colorado River and the longer expeditions of the Grand and Cataract Canyons. 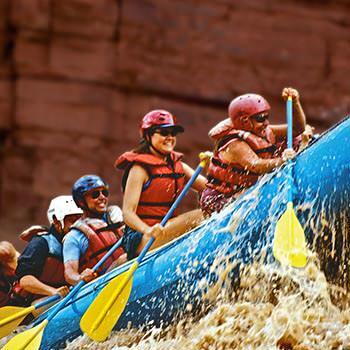 This raft offers a very comfortable ride on a Cataract Canyon whitewater rafting trip. You'll find plenty of space to stretch out and relax in the calm sections of the river and an exciting ride in the whitewater stretches. With plenty of seat positions to choose from, you can decide whether you'll ride up front for more action or further back for a calmer experience. In late June or early July when water flows on the Colorado River begin to decrease, and channels between the boulders get more narrow, Western makes the switch to using a modified S-Rig configuration with oar boats and paddle rafts carefully lashed as outriggers. This provides a "party barge" during the calm water portions that generally make up the first two days of the expedition, before rapids begin. Once rapids begin, the party barge configuration is broken down into oar boats, paddle rafts, and the S-Rig. Oar-Rigs are the most ubiquitous types of craft for river rafting around the world. They are steered and powered by one guide who sits at the helm in the middle with long oars in hand. Upturned on both front and rear makes it easy to challenge a rapid (or any other obstacle) either frontwards or backwards. There is room for cargo in the lower load, and generally in the rear behind the guide. Passengers may lounge anywhere free of the oars during calm water, but during rapids you will actively hold on with a front and rear hand-hold and "punch" the tubes with your body to help the raft break through large waves when necessary. It's a lot of fun! The oar rig is home base for those who may be a little more timid about whitewater rapids. Paddle rafts are guided from the rear by a "Paddle Captain" who will both steer and shout commands for left or right side to paddle forward or backward with multiple combinations of commands depending on the rapid. This is the most active group activity in all of rafting, and much really does depend on you, your ability to follow commands, grip the paddle securely, and dig deep with each stroke. This is also what makes it so rewarding, both individually and as a paddle team. It gets you even closer to feeling every move the river makes.